Meathooks has called for a retraction. I lost a 25 cent bet to Cousin Paulie. Cleveland is happy, and its residents will be making sweet, sweet love tonight because the Browns actually won a game. But I still can't stand Johnny "Freakin" Football. I just don't like him as a human being, a person. I try not to judge people, but when the weight of my Cleveland Browns falls on his 5-foot-6 shoulders, I believe I'm allowed to ponder this guy. First of all, thank God the Browns beat the Tennessee Titans to improve to 1-1 and hold on for a 28-14 win. Manziel threw two touchdown bombs to Travis Benjamin, and those were the obvious offensive highlights. The first TD bomb on the second play of the game set the tone, and Johnny Football deserves major credit for that. I've upgraded my thoughts on Manziel from "he's an absolute bust" to "let's wait and see — but he's probably a bust." I am conflicted on whether I want him to be a bust. With a Browns first philosophy, I want him to work out and be a superstar. However, he is the most unlikable sports figure to don a Cleveland uniform — according to me. I'm not even sure who's in the running. Albert Belle from the Indians was much-maligned. Ricky Davis from the Cavs could be redonkulous. I'm sure there have been plenty of criminals, but Manziel remains the biggest douche. This could be a Snooze Button Generation (TM) gap. This punk is only 22, and I'm 41. Maybe there is a generation gap with this kid because I repeatedly look at him and think, "You got to be kidding me." 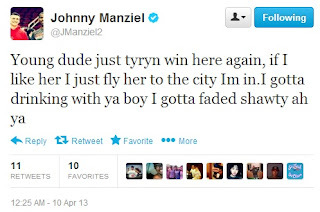 My gut tells me that Manziel still has the maturity of a flea. My gut says that he is all flash — and no substance. Even in football, he had two spectacular TD flings. But other than that, he was not good. Johnny Football's success on the field may very well have to do with his mentality. I believe he has a highlight-reel mentality, but I'm not convinced he knows how to do little things to get a team to win. I also surmise his personal life is like that. I bet he'd be a great guy to date because of the flash, but when it comes to hanging out at home and feeling chill, he'd be fumbling all night long. Would I want my daughters to date him? Oh, God no. Would you want that for your daughters? I don't trust Johnny Manziel, and I don't like that feeling. When the weight of the Cleveland Cavs is on LeBron James' shoulders, yes, I'll take that. 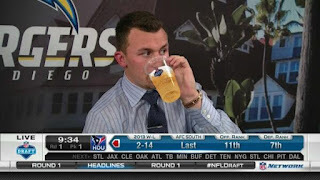 If the weight of the franchise is on Manziel's shoulders, I am still thinking, "What has happened to us?" But, hey, let's put this all in perspective. The Browns won. They're 1-1, and they've been to the playoffs once in the past 20 years. Even if today ends up as the highlight of Manziel's career, we'll take it!